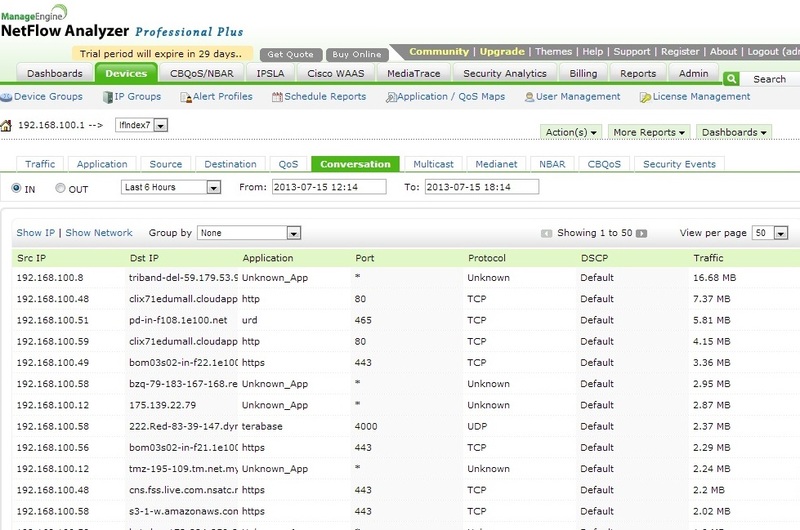 NetFlow is a network protocol developed by Cisco Systems for collecting IP traffic information. NetFlow has become an industry standard for traffic monitoring and is supported on various platforms. Routers or switches that support NetFlow can collect IP traffic statistics on all interfaces where NetFlow is enabled, and later export those statistics as NetFlow records, towards at least one NetFlow collector. A network flow can be defined in many ways. Cisco standard NetFlow defines a flow as a unidirectional sequence of packets that all share the following 7 values. Netflow configuration on Cisco routers is very simple, just enable the NetFlow on interfaces, define the version to be used and the destination i.e. IP address of the NetFlow collector. In the below image, we will configure the router to send the flows to the workstation 192.168.100.20, where NetFlow Analyzer is installed. Just this much configuration will start sending the Flows towards Netflow Analyzer. Here is the sample output for the LAN segment from the above scenario. 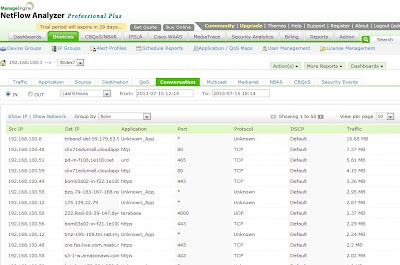 NetFlow top-talkers feature is also very handy to use from Command Line Interface when you want to identify users who are utilizing more WAN bandwidth. To configu-re flow-top-talkers, just add the following configuration to the above configuration on the Router. 20 of 20 top talkers shown. 380 flows processed.